Once you've mastered the art of the oven and microwave you might think that's all there is to cooking a decent meal. However innovations in kitchen technology over the years have meant there are now literally hundreds of gadgets and appliances that are designed to make our lives easier. Whilst some inevitably do make certain tasks far easier to complete, many of these gizmos are so complicated to use that you'd be quicker doing it all by hand! As a student, you're unlikely to have too many complicated or seldom used appliances but you might be lucky enough to have a couple of handy items that have passed on to you by parents keen to have a clear out. We've chosen a few of the more useful appliances below. If you're offered one of these by someone take him or her up on the offer immediately. If you only have one appliance in your kitchen, this is the one to pick. Although it's a little bulky and may well require its very own shelf or cupboard, its usefulness more than makes up for its size. Food processors can be used for small, boring tasks such as chopping onions or other vegetables, right up to blending juices or soups. If you get into the habit of using it, you'll quickly find that it's an indispensable piece of equipment. When you've got an odd assortment of vegetables at the bottom of your fridge you can make a big batch of soup for the freezer. 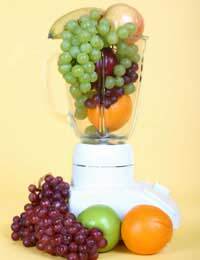 Likewise, whiz up a few pieces of fruit with some milk or yogurt and add a spoon of honey, for a healthy breakfast smoothie. This is the way forward for delicious, healthy vegetables. These are relatively cheap to buy and you can make your whole meal in the steamer at the same time, simply by working out the timings and stacking the trays on top of one another in the right order. They're really easy to use, as you just top up the base with water, set the clock running and place the vegetables, meat or fish in the trays above. You should always follow the instruction booklet for the exact timings for different ingredients and check them before dishing up. You'll notice that vegetables retain their vibrant colours and this is because more of the vitamins are retained: you pour a lot of these down the sink when you boil vegetables. This is a great little appliance that will get plenty of use in a student household. Although it might seem self explanatory, there is a certain knack to using one. You should make sure that it's properly preheated and don't be tempted to put the sandwich in beforehand - it will end up soggy. A good tip is to smear a little butter on the plates before heating. This helps to stop the bread sticking to the plates and your sandwich should slide out nice and easily when it's cooked. Never be tempted to overfill the sandwich as you'll just end up with the filling oozing out all over the work surface and it's a real pain to clean it off the sandwich toaster once it has cooled down. If you're using big slices of bread, you might want to trim the crusts so that the sandwich fits in a little better. If you've got cheese in the filling, allow the sandwich to cool down a little before you eat it: cheese gets very hot and you don't want to suffer any injuries from a sandwich!